The Aaron 2250 is a multipurpose electrosurgical generator for use in the modern operating room and surgi-center. It features both monopolar and bipolar functions to satisfy all of your surgical demands with safety, flexibility, reliability, and convenience. Ten Blend Settings You don’t have to settle for one or two blend modes anymore. With the Aaron 2250 you have ten different blend settings plus cut, all with 200 watts maximum power output for the most demanding procedures. Bovie’s Cut II is tailored specifically for Laparoscopic procedures. The mode offers a precisely managed cutting energy that limits output thereby minimizing the potential risk of capacitive coupling and alternate site burns. The Aaron SurgiCenter|PRO offers simultaneous activation in spray with audible activation tones. The simultaneous delivery produces equal and even power outputs in each accessory, for a safer delivery of dual monopolar energy. The power can be adjusted up or down in variable steps while performing procedure, to increase procedural efficiency and provide the appropriate amount of power to the surgical site. 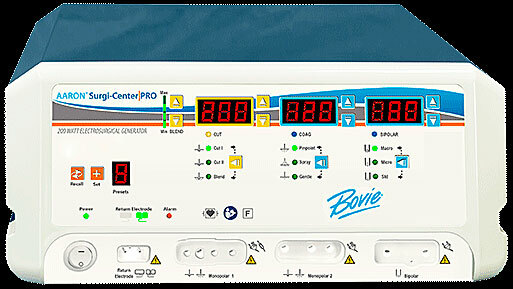 The Aaron® SurgiCenter|PRO recalls the last used power and mode. The surgeon can store 10 user-defined RF presets for easy recall. This return electrode contact quality monitoring system is designed to minimize the risk of patient burns at the return electrode site. This feature works in conjunction with disposable split return electrodes. Bovie FDFS™ - The tissue sensing technology measure tissue 5 million times a second and adjusts to varying impedances 5000 times a second for accurate energy delivery. Automatic system self-checks upon powering up the unit. Cut I – A general cutting with a standard RF waveform used in open and endoscopic surgical procedure, Cut I is for use in a wide range of tissue with minimal hemostasis. Cut II – Tailored specifically for Laparoscopic procedures, Cut II offers a precisely managed cutting energy that limits output for the minimizing of the potential risk of capacitive coupling and alternate site burns due to weakened insulation. Blend (Level 1, 2, 3 & 4) – Blended cutting offers varying levels of hemostasis during a cut procedure providing increased control of bleeding at the surgical application site. Pinpoint – A general coagulation mode delivering rapid desiccation effects with minimal tissue damage. Spray – Recommended for hemostasis in highly vascular or large surface areas and for non-contact tissue coagulation to control superficial bleeding. Spray mode permits dual, simultaneous activation of two monopolar accessories with audible dual activation tone alert. Gentle – Gentle mode offers more concentrated coagulation than in other modes. For instance, when coagulation is necessary in short amounts of time, reduced electrode carbonization is provided. Macro – Intense bipolar output allowing for aggressive coagulation, with cut-like effects over a wide range of tissue. Micro – Fine bipolar coagulation for use in extremely gentle and precise surgical applications. Standard – Bipolar coagulation which gently coagulates tissue for minimal tissue damage reducing carbonization and sticking.